Next up, more Japanese tapes, but "normal" ones. These were on eBay for months and the seller threw all six in a lot. No one bid so I got these for $6 a pop. 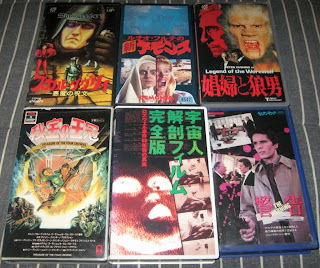 The last three are interesting, with the first being 1980's Alien 2 sulla Terra. This was probably the last Japanese VHS I ever remember seeing online so it's great to finally own a copy. Night Warning is in like new condition and I figured it might sadly take Code Red awhile to release their DVD. The last is a 73 minute Japanese horror anthology from 1995 released by KSS Films that I had to do some digging on to find info on. The title, 身の毛もよだつ 恐怖劇場, translates into "Horrible Scary Movie". The two stories after "『noise』" translate into "Marie Brady" and "Homemade". I can't find a director(s) or cast members yet. I'm scared just thinking about what is on those Death Press videos. 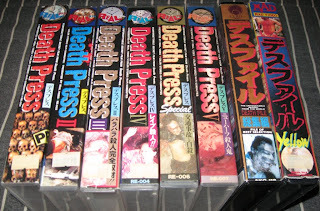 its so cool you found those death press tapes. i can never find anything on them anywhere. it drives me nuts! not so much that what's on them may be morally unpleasant, but that i can't see for myself.